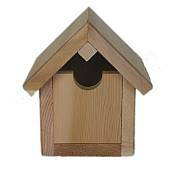 This Cedar Birdhouse is made using clear Western Red Cedar, giving it a distinct advantage over the elements of nature (whether finished or left unfinished). Western Red Cedar fibers contain oils that act as natural preservatives to help the wood resist rot and decay, making it an excellent material for outdoor items. This birdhouse features a pivoting front door for easy access for wrens and other small birds. It is handcrafted for snug-fitting parts and is built to last. What a beautiful spot to enjoy wildlife right in your own backyard!